If you’ve been following my blog and recipes for some time, you’ll know that whilst I adore calorie-laden, fat-rich, exquisitely decadent and rich food, I have to temper this with some very low-calorie, low-fat, healthy food…for health reasons that are relevant to all, of course, and because weight has always been an issue for me. 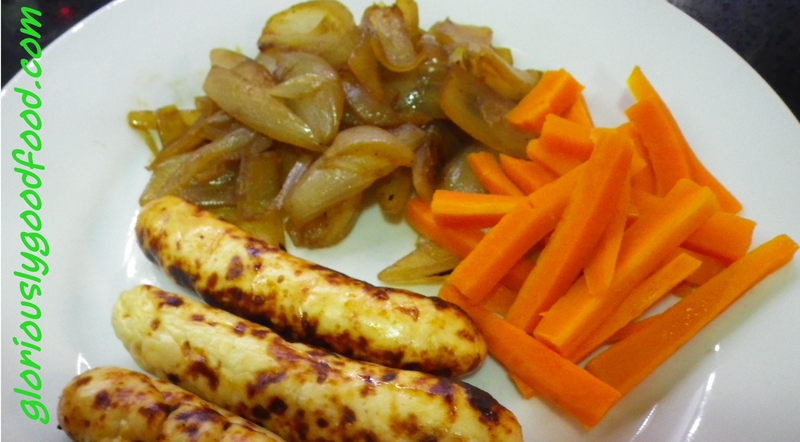 I’m therefore delighted to have come up with these really healthy sausages: Chicken Sausages…don’t run for the hills! With the addition of apples, these chicken sausages are deliciously moist and full of flavour! You can play around with the recipe to alter the flavour profile; for example, you could season with sea salt and a touch of cinnamon to complement the apples. Or you could use celery salt. I’ve used Knorr Aromat because I find chicken can sometimes need a big kick of seasoning and Aromat achieves this, but I am conscious of the fact that it contains a lot of MSG and may not be of everyone’s choosing for that reason. So if you just want to substitute the Aromat without going wild with other seasonings, you could just season generously with sea salt and a little bit of freshly-ground black pepper. Grind/Mince the chicken breast and apple pieces together, on a medium setting. If you don’t have a meat mincing machine, you can buy ready-minced chicken breast meat and grate the apples (or, for more texture, finely chop them). Thread the sausage casing onto your sausage-making nozzle and gently feed through the chicken sausage mixture. This is a very wet mixture so the sausages are very soft. I’ve found the easiest way to make these chicken sausages is to make one long continuous sausage, then fold it into 7 equal lengths on a big chopping board. You can then twist and cut at the end of each length, then gently fold each length into 3 and twist & cut at the folds. This will then give you 21 fairly even-sized healthy chicken sausages. Freeze any you don’t want to use immediately. Cooking: Grill, barbecue, dry-fry in a non-stick pan or cook on a griddle. Serve with a mixed salad or steamed fresh vegetables. Enjoy! These healthy sausages are a real low-fat, low-cal treat and very satisfying as a 3-sausage portion is a decent size meal, but if you don’t have a sausage-making machine, you can still mix the ingredients as above, but then make them into patties/burgers instead. This entry was posted in Chicken, Low Fat / Low Cal, Meat & Poultry, Sausages, Uncategorized and tagged apple, chicken, chicken and apple sausage, chicken and apple sausages, chicken sausage, chicken sausages, healthy sausages, healthy6 sausages, hy sausage, low-cal sausage, low-cal sausages, low-fat sausages, sausages. Bookmark the permalink.